I went outside this morning to read by the Castle. Finding shade under a cherry tree, drawing, convening with the Lord through time to sit and read His word, especially Deuteronomy 6, in this week of Parsha Va`etchanan. At some point in to the reading, I realized He was showing me something, a picture, that He knew I would want to take, and I looked up. I was moved to get up! And found a good spot to take it! It was A heron high in a tree. Up there, can you see? Then I sat and drew some more. There were workers doing upkeep on the Castle walls and around the moat, and everything bathed in His light. Then after a little while of being there, two women, a little older and with Japanese parasols, appeared walking towards me. They were sweet and ladylike and expressed that they were glad to see me there admiring the beauty of creation. They seemed to come out of a world where once people did so, and commented that people don`t stop to admire the beauty so much these days. I showed them some of my sketches and they flatteringly said `上手｀`jo-u-zu`(it means `very good!`) though I don`t know that they are `jo-u-zu` really they are quite child-like, but they are from my heart. Standing in that spot with them the morning seemed alive as we three watched the fish swimming in the moat, turtles too, birds flying, and the dappled light making patterns through the trees. Then one of the women signaled to the other and she opened up a package one of them was holding and took out two sparkling rings of some kind of treat. It was goya! Goya is a summer season vegetable in Japan that is very bitter! It has a rough skin on the outside. You have to prepare it by scooping out the seeds and there are ways to cut the bitterness if you prefer to. I have recently been cooking it on summer nights as it is said to give stamina in the hot days. But I never saw it like this, all coated with sugar and in perfect rings!! I believe it was a delicacy and a new taste, something from the Almighty himself to give me strength and taste His sweetness on this summer day. Soon they continued on their way, these two Japanese women receding into the far distance with their umbrellas. I held the rings of goya up close to see the castle through them, like vignettes of all the views I had been seeing. Then I gave thanks and tasted the bitter sweet. It was a new taste, sparkling with sweetness more than bitter, with the sugar all around in a ring. Everyday is, a gift from our King. I enjoyed your post. As I read it it transported me to the beautiful day there (as I read it is night here) by the water and in the shade of the lush, green tree. The two ladies seem very sweet and friendly and the scripture verse you started with is one of my very favourite ones. It reminds me that so many good things are given by our Father to us daily. Shabbat Shalom! Shabbat Shalom, Shayndel...Joanne. 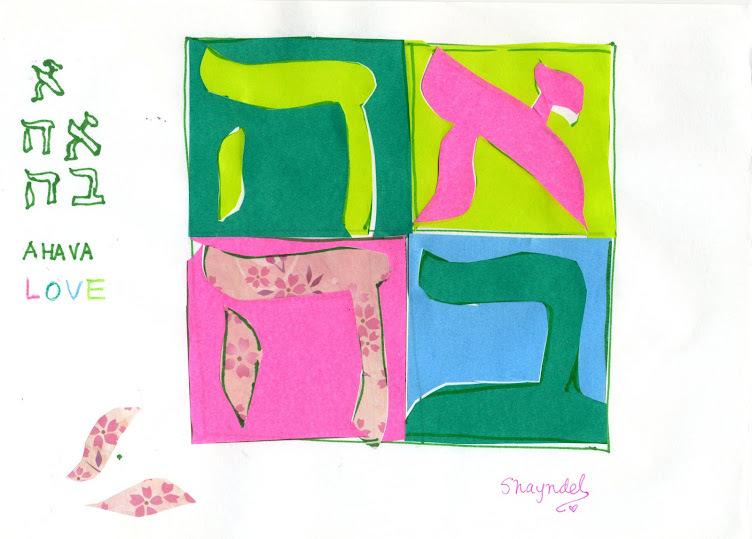 :) It is not quite Shabbat here, but 'shalom' nonetheless! I had a hard time seeing the worker-- but then he came into view! He, and his ladder, blended in with the wall he was working on. There is probably a message in that. How is your daughter doing in her new college home? I remember we prayed fir her, my little Thursday night prayer group. "...really they are quite child-like, but they are from my heart." Interesting about the message in the worker blending in, yes! They really seem to be humbly doing their work, and it is so beautiful how they don`t `stand out` and a lesson in that for sure. It was interesting, as he moved the ladder to work on another area, and little by little the ladder and he almost became hidden from view behind the `corner` or the wall. Butted up against the cornerstone. Always leading back to our great teacher and LORD Yeshua!! Praying you are doing ok after that storm hit Japan. He makes the bitter sweet! Only after enlarging the picture, did I spot the worker on the ladder- completely blended into the color of the rock. What a fascinating view! I try to imagine the two japanese women with their umbrellas.You could have done a beautiful drawing on that. Thank you for these comments and reading and looking at the photos even finding the worker on the ladder! One more viewing challenge!! I realize I forgot to add a caption , in the picture with the `goya ring` there is another worker in the circle of the ring!! Also may be a little hard to see, as the figure blends in with the wall, but he is in the circle `frame`, if you find it, let me know!! A blessed week, weekend still in some places, to all and much love!! We have a typhoon coming this way but hopefully it will pass this time without harm. Yes, again,I've enlarged the photo, and I think I've spotted the worker. Only this time he's not so blended in the rock color like the one on the ladder; there's some pink color on his shirt. Am I right? Stay safe , don't let the typhoon worry you! Thank you Duta!! Yes, that`s right!! You saw well!! Thank you for your reassurance about the typhoon, after all it was amazingly calm at night, but just woke up surprised in the middle of the night to heavy rain, but it must have been quick, and in the morning all clear, with the clouds making way to openings of blue!! I see the workers. Love this story and your drawing and your description of them being from your heart. Oh, yes! Interesting Bible you have. And what a beautiful country you live in. Hi Mary, Thank you, I receive your kind words, yes Japan is a beautiful country, Glory to God. Thanks also for noticing the Bible, yes! Another one that is my most read probably is the Tree of Life Version. Its also a Messianic version, and a little lighter to carry than this study Bible!! God Bless you, lots of love to you too!! It has been a blessing to read your blog post this morning and to see your photos of the people and nature all around you. Your observations are guided by the Holy Spirit. 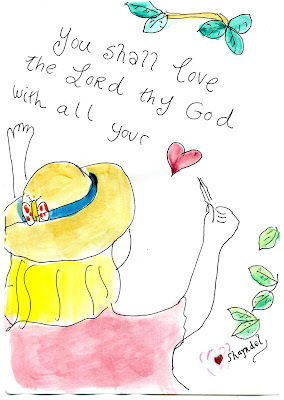 How wonderful that you can create beautiful drawings that communicate the goodness of God to others. It was a blessing to encounter the two ladies and to be able to talk to them. It is a joy to see everything through the light of God's grace. Every blessing. Thank you a rich tapestry. I am so glad something in the post spoke to you and likewise am blessed by your visit!! Love little moments like this!